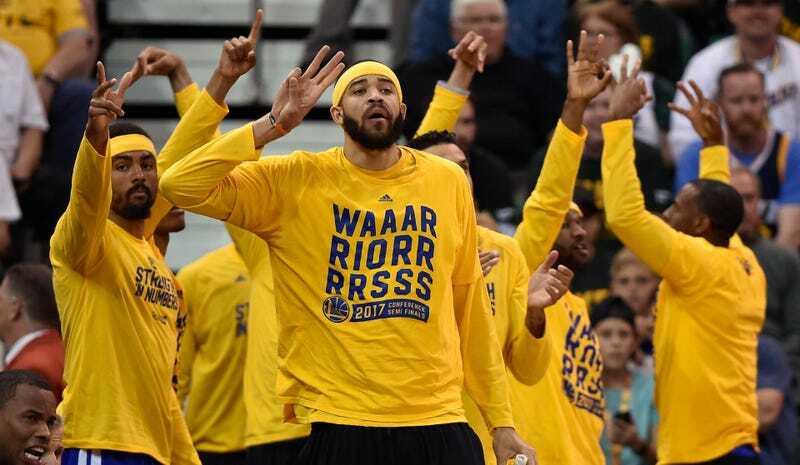 JaVale McGee has had a resurgent season with the Golden State Warriors, playing in more games than he has since 2012-13 and averaging seven points per game in the playoffs. He’s emerged as a reliable alley-oop muse within the Warriors hyperkinetic offense, and he has rescued a once-moribund career. Last season, he played just 34 games for the Mavericks before getting waived early in the offseason, and before the Warriors signed him, it appeared that his career might be in jeopardy. Now, he could very well win a championship and earn himself a decent contract. However, he also needs to wrap up a small legal matter from his time in Texas. According to court documents obtained by Deadspin, McGee was sued last November by the landlord he rented an apartment from in Dallas for a number of alleged violations. The lawsuit, which was filed on Nov. 1, 2016, and can be found in full below, claimed that McGee rented an apartment from Matthew T. Johnson in the Highland Park neighborhood from September 2015 to September 2016. Johnson alleges that McGee caused severe damage to the property that prevented him from renting it out for two months, owed money in late rent fees, failed to pay rent for the last half of the month of September 2016, and kept a cat for 178 days, despite the lease agreement specifically forbidding pets. In January, McGee denied all the allegations and demanded “strict proof,” in an answer filed with the court. Then late last week he fessed up to a number of the alleged breaches of contract in an amended answer to Johnson’s complaints. He admitted to skipping out on rent and being late on a few payments, as well as housing the cat. But McGee denied that he caused any serious harm to the property and did not offer to pay for the supposed “significant damage” to fixtures or furniture. The cat in question appears to be McGee’s hairless cat Raja, who was born in Dec. 2015. All in all, he agreed to pay for all the late and unpaid rent he owed, $12,000 in repairs, as well as $9,350 in cat-related fees. Subtracting his security deposit and tacking on an extra $10,000 for legal fees that Johnson requested, McGee agreed to pay $26,000. He submitted a petition to confess judgment yesterday. Johnson’s legal representation hasn’t commented on McGee’s petition or filed a motion of their own, and a non-jury trial is currently scheduled for November. The Warriors and McGee both declined to comment on the lawsuit.